Former Probation Department chief John J. O’Brien, shown in court on Friday, faces five charges of bribery and corruption in his conduct of the department over 12 years. A top aide to former Probation Department head John J. O’Brien testified in state court Monday that O’Brien had organized a fund-raiser for Timothy Cahill, then state treasurer, under the understanding it would help O’Brien’s wife get a job. 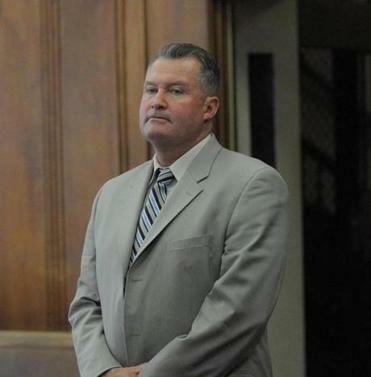 Francis Wall, a former deputy commissioner under O’Brien who was intimately involved in the office’s hiring and political activities, told jurors in Suffolk Superior Court that he encouraged other employees in the depart­ment to attend the 2005 fund-raiser in Quincy. Wall said that O’Brien told him his wife Laurie O’Brien was getting a job in the Massachusetts State Lottery Commission, a division of the state treasurer’s office, and the fund-raiser was to show his appreciation. More than $11,000 was raised for Cahill’s campaign fund, and more than 50 Probation Depart­ment workers attended the event. “Later on, he informed me his wife had gotten a position,” said Wall, 62, who retired not long after a series of articles by the Globe Spotlight Team on political patronage and cronyism within the department, leading to state and federal charges against O’Brien and other state officials. O’Brien faces five charges of bribery and corruption in his conduct of the Probation Depart­ment over 12 years. Each charge carries a possible prison sentence of up to five years. He also faces a racketeering indictment in federal court. Cahill has denied any wrongdoing in the hiring of Laurie O’Brien and has never been charged. One of his top aides faces charges in relation to the hiring in state court. Laurie O’Brien still works for the Lottery Commission as a customer service representative with a salary of about $40,000. Wall was granted immunity for his cooperation with prosecutors and for testifying against O’Brien. He was the second former top aide to tell jurors that O’Brien organized the fund-raiser in exchange for his wife’s job, the crux of the charges in the state case. Wall also told jurors that O’Brien would hire and promote employees based on their connections to people in state government, in the Legislature, and the court system. Paul Flavin, O’Brien’s attorney, suggested in court Monday that O’Brien had been running the department the way it had historically been run, with liaisons to the Legislature, and that while it was political, nothing was illegal. Under Flavin’s questioning, Wall also acknowledged that he had in the past told investigators under oath that he and O’Brien had no role in hiring people connected to state government. Flavin sought to argue that Wall was shaping his testimony in the state case to curry favor with prosecutors, so he would not expose himself to charges and risk the loss of his pension. “You realize, lying as a probation officer is a crime; . . . it’s perjury,” Flavin said, to which Wall agreed. raiser on their own choosing and that O’Brien played no role. “Word would get around the office that people were going, that the commissioner was going?” Flavin asked, suggesting it was more of a social event. Wall acknowledged that word spread about the event. “Was it a good time?” Flavin asked. “It was a fund-raiser,” Wall responded. globe.com. Follow him on ­Twitter @miltonvalencia.